Last week we published a very long article about the upcoming Orion pricing model. This is the condensed version that covers all the important points in a nutshell. Enjoy! Per-site pricing: Got 8 websites? You’ll only pay for 8 websites. not 10, not 15. Multiple plans on one account: Put as many different plans as you want on a single account. Custom, a la carte plans: Choose the tools you need, build your plans to best fit your needs. Pay-as-you-go: You no longer need to upgrade or downgrade. When you move a website to another plan, the subscription automatically adjusts. Unlimited free websites: You can now keep hundreds of free websites on the same ManageWP dashboard as your premium websites. Right now all ManageWP users (except those on the Free plan) can access their mirrored Orion account. It’s the inconspicuous tab icon at the top right, in case you ever wondered. Try it, get to know Orion. The layout is a bit different, so it might take a bit to get used to it. Roughly 8 weeks from now we will take the Classic dashboard offline, and move everyone to Orion. At this point the Orion pricing model will go live. All active ManageWP subscribers will be grandfathered. Your legacy plan and all your websites will be waiting for you. The Classic backup will be replaced by the Orion backup, at no extra cost. You will not be able to change the number of websites on your legacy plan; if you plan on expanding your business, upgrade before Classic gets phased out. We’re switching from a per-domain to a per-site model. If you have multiple websites on a single domain (e.g. you are on Business (10 domains) but have 17 websites), the excess websites will not be removed. As long as they are on your dashboard, they will be managed as usual. If you remove them from the legacy plan, you won’t be able to add it back if you’re over the plan limit. You can keep your legacy plan and experiment with the Orion plans at the same time. Your legacy plan will basically be treated as just another plan on your ManageWP dashboard. Your lifetime discounts will be honored in Orion. If you choose to cancel your legacy subscription, you will be pro rated upon request. Create a plan by picking the tools you need, and naming the plan. Drag and drop your websites to that plan. The tools have a straightforward, per-site pricing. Uptime Monitor is $1/month. Daily Backup is $2/month. This means that each website on the Uptime Monitor + Daily Backup plan is $3/month. This makes it very easy for you to compare your cost to the fee you’re charging your client. There are several discounts that offset the cost if you pick multiple tools for a plan, if you have 15+ websites, and a few more. All existing ManageWP lifetime discounts will be honored. I’m still confusing with this. At this time, I owned Professional account with 10 domains. What’s happened with my account if I switch to Orion? Do I need pay more or somethings else? You can stick with the current subscription fee and keep paying what you paid so far. Or, you could switch to the Orion pricing model, if it makes more sense financially. Yeah, the development has to resolve a lot more issues than what we initially expected, and it pushed back the launch. But now we finally have a date! Hi, any news on when the new pricing will go live? Yes, in a few weeks’ time we’ll open up the new Orion pricing model and the dashboard to everyone, not just the current subscribers. Expect an article with more details next week! Hi, I cannot find the auto update function(Of wordpress, plug in and templates) in Orion. Can you point me in the right direction? Auto updates are not in Orion yet, but the feature is on the roadmap after the initial release in the Summer. I’m currently on the free plan ( 5 websites). What will happen to my dashboard once the old version gets phased out ? As a free-plan user I can’t loggin (any more) on the Orion Dashboard. When the old version gets phased out, you’ll get your own Orion dashboard (probably even sooner, we’ll let Free users into Orion in the next month or so, so you could get used to it). You won’t have to subscribe to a premium plan, and you’ll get everything you currently have on the Free plan, plus a lot more: unlimited number of websites, Google Analytics, Manage Users, Client Report, etc. In the meantime, you can sign up for a Standard plan if you want to start using Orion right away. It will also let you test the Orion backups, which are pretty amazing on their own. Nemanja, still not able to login to Orion as a free user. I have a professional subscription (25 sites) now, if i use the calculator to calculate the costs of the new orion pricing i almost pay the same (i think). Now i am really doubting if i have to switch before the change to Orion or after that, it is not really clear to me what the best choice for me is. Can you help me with that? Yes, the price is roughly the same. 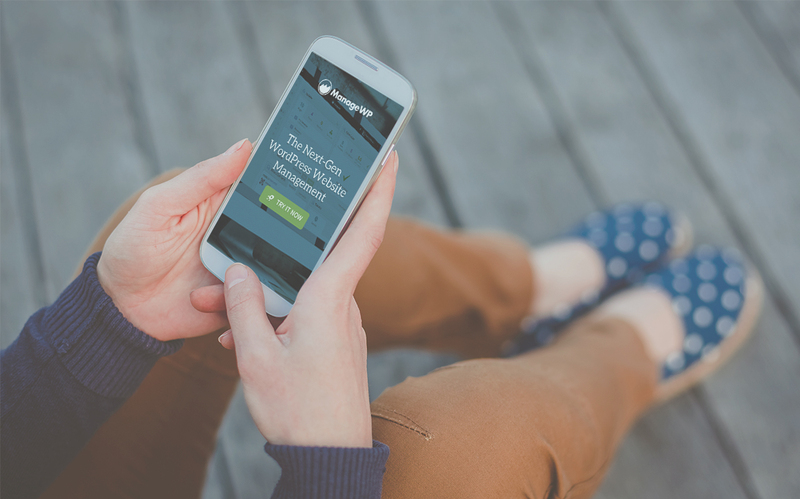 – Once the new pricing goes live, you can remain on the legacy subscription and test the water. No need to rush into anything if you don’t see a clear benefit. At some point you’ll grow out of your legacy plan, and you can start adding new websites to the Orion pricing model, without having to cancel your legacy plan (Orion lets you mix plans, including the legacy plan). Thanks for you swift reply. i am already testing and using Orion, i like it. Especially the daily backup functionality based on restore points. If i continue to use my legacy subscription for now, do i also have the use over that? I only noticed that sometimes when i update a plugin through Orion it does not apply correct and the folder of the plugin that is updated is empty when i check it through ftp, is that a known bug? or am i doing something wrong? – Your legacy plan will be locked. You won’t be able to upgrade or downgrade, but you’ll be able to keep it active indefinitely. – Classic backups will be phased out, you’ll get the Daily Orion Backup instead. Yeah, that’s basically a free upgrade for you, since the new backup is insanely better. – Uploads to external destinations (e.g. your Dropbox account) will be charged extra, at an $0.10/GB at-cost fee. Our own S3 storage comes free with each backup tool. Orion updates should work the same way as Classic updates. Our developers would like to find out why this is happening. Could you open a support ticket with more info, so we could investigate and get it sorted out? The ACME Ideal Plan Builder picture at the bottom is clickable. Very nice and very clear price model. There is only one thing I don’t see in this blog. With a free plan, are you able to perform a manual backup? Little confused, help me out here, we’ve been with you from the beginning. We currently have the Business Level package at 500 sites level, although we upgraded recently we dropped down to only 239 sites managed. The first option is great if you use all the Business tools (SEO, Daily Backup, White Label, Uptime Monitor), and if you use them on all your websites. I also recommend it if you plan on scaling your business to 300+ in the near future. The second option is great for multi-tiered service. If you have 180 websites that need only the backup, and another 50 that need SEO and White Label, it might be more cost effective to switch to Orion pricing. If you require further explanation, hit us up at helpdesk@managewp.com so you could tell us your use case and help us figure out what’s best for your business. For as many people using Manage WP as a staging site tool – because it is the best on the market for that – I think you guys may want to consider including a staging site for each website. I’m not sure how you would implement that – BUT it would then set you even further apart as the management tool that provides staging as a major feature. It’s something everyone would like to see, and I’m happy to say that we are working on a solution. You won’t get anything else out of me for now! Glad to hear it! Currently the only host I know of, wait I think there is ONE more, but the only one I can think of that does a built in staging site at this point is WP Engine. This ability basically provides it to ALL of us – and we love it 🙂 – thanks!! I am primarily concerned about pricing. If I understand it right, my price is going to go up significantly. I want ALL of the features that I have now. But paying per feature will make me pay around $13/site. I only pay $2 and some change right now. Talk about a huge increase! My business cannot afofr that. Please tell me I am understanfding this wrong! If I am reading it right, I have no choice, I have to go back to CMS Commander. On the other hand, I just used your calculator, and it says that 10 sites will run me $45, so about 4.50 per site. That is still double my current price, but not as bad. Please help me understand this pricing structure better! I think there was some kind of misunderstanding, because that’s an almost impossibly high price hike. I’ll assume that you’re currently on the Business (10) plan, which is $42/month. 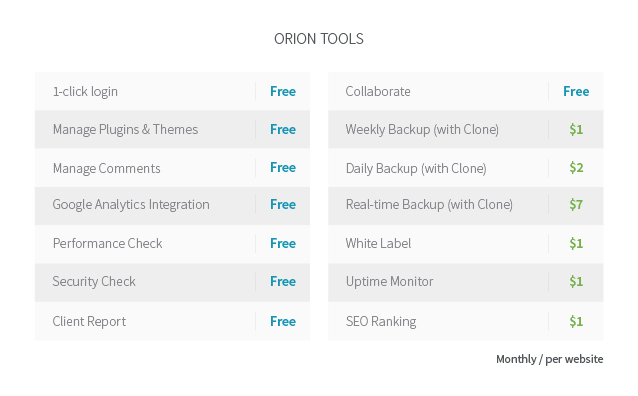 The same set of tools in Orion (Daily Backup, Uptime MOnitor, SEO Ranking, White Label) costs $45/month. For those extra $3 you get a set of improved tools and a serious upgrade to your backup, which is way more robust than the Classic Backup. If you’re on Professional (10) that’s the current $24/month against the $20/month in Orion. That’s an even better scenario for you, since you get better tools for less money. And the best part? If you add an 11th website, you won’t have to upgrade your licence to 15 websites – you’ll simply pay an extra few buck for that one website. I’m confident that you’ll love the Orion pricing model once you get to know it. I’ll be honest, I’ve barely had time to skim the information and I don’t completely understand what’s happening, except that my dashboard and pricing will change somehow. I’m trying not to resent these changes coming up at a time when my workload is nearly killing me. I don’t have time to learn a new system or try to calculate what my new pricing will be. I’m assuming no major changes will happen without my approval and that I’ll be getting an e-mail telling me what my new price will be before I incur any charges at a rate I didn’t sign on for. I’ll decide then whether to continue my service. If I like the new price, I’ll test-drive the new dashboard. If not, I’m not spending any time on that. You are correct, Lauren. Your current plan and subscription fee will remain active, and everything will keep humming until you’re ready to explore the new pricing model. So, backing up to our S3 account ALSO is no longer an option? I’d pay for that option. I’ll need to buy a separate non-ManageWP plugin for that? I’m a fan of redundancy for backups. I do the same with my own computer. Two different backups locally (including a bootable backup) to external drives, and a backup to BackBlaze. Because stuff happens. The option of uploading backups to your own S3, Dropbox and Google Drive is coming next week. This option will be charged at-cost, which we calculated roughly at $0.10/GB (what we pay Amazon to get the backup from our storage to yours). You will also have the option of adding multiple S3, Dropbox and Google Drive accounts. I’m thinking of getting Desktop Server for local hosting – for ease of use and easy transfer between live and local. Is the Orion Clone compatible with Desktop Server do you know? I’m trying to get an easy “push button” solution for my iMac so want to get as uncomplicated as possible. No reason why Orion shouldn’t work. The Classic is working great already, and not much has essentially changed. I don’t personally know anyone using Desktop Server, so I can’t make any guarantees, but we’d be interesting in making it work. I see benefits to this change. First off, having all sites in one account will be awesometastic! 😉 Switching back and forth breaks the workflow. I have 5 sites on the business plan and not using the features to extra features to the fullest. It’s great to know that new plan supports changing needs. I’ve got about 20 sites total on the standard plan with some dev sites. It’s good to know the test sites will be free. I’m still not clear on the details for annual payment. I signed up in January and my guess is I will request a prorate and have all my sites in one place and pick and choose what sites need the more robust features. Is that correct? Is cloning a feature for the free account? Most cases after the dev phase is complete, I’ll clone it to a live domain and it remains on my server and then added to MWP. Thank you for making our WP workflow so much easier. I’m still discovering new features. P.S. I’ve been looking for the cloning tool in Orion. Is it available yet? Your total cost that month will be an additional $0.03 (that's one day of Weekly Backup for one website). Orion calculates the cost automatically – once per day it looks which websites are on which plan, and adds up the cost to the monthly bill. Thank you Samantha, I try to make sure every question is answered – pricing model change is a serious matter. – Your annual subscription will remain active for as long as you want. Once you decide that you no longer need it, you’ll let us know and we will pro rate you. – Orion Clone has been live for a while, and a few days ago we added the option of cloning to an existing website. You will find the Clone tool on the Backup screen in Orion. This will work out great for us and I never liked the constant upgrading. Simplicity is awesome! This presents a far better opportunity for myself and the other users. I’ve only been a user for 2 months and have been experimenting with pricing plans for my clients in some small samples for feedback. The one thing that seems to pop up is people asking for certain features from the “more robust” plan at some sort of hybrid cost/custom plan. With the ability to customize my plans now, I have so many more options when it comes to designing plans for clients. I’m considering mirroring your setup with a base package and letting people customize the plans themselves. Give the people what they want, right?! By the way, I love “Awesometastic” as a word and look forward to slipping into conversations later today. Keep up the great work! Thank you for your feedback, Kenny! Let me know how “Awesometastic” fared – so far I haven’t managed to bring others on board. Will you be migrating Manage Themes and Plugins over to Orion anytime soon? I have been concerned about the pricing plan since you announced Orion, but it looks like you nailed it. I like the prices, and the way you put it together. Thanks for all your hard work. Thank you for your support, Daniel! I would like to have the newsletter if it is FREE. Thanks. We currently have a Business plan with 14 sites. We clone these sites down to staging environments to test updates before we push them live. With the new payment plan will be be paying for both our live and staging sites? Your total cost that month will be an additional $0.03 (that’s one day of Weekly Backup for one website). Hi there,I’m trying to figure out whether to upgrade now or wait until the orion phase in . i do have a 30% lifetime discount available, all i need at this stage is 7 domains with an option to scale up at a later time. I would like weekly updates (with option to go daily as things grow)… this is under the professional plan…right now this comes to $1.37 per domain under an annual plan, with the calculator is looks like $2 per month, is this correct? Your 30% discount will be honored in Orion, so the Dialy Backup with the Orion pricing model would be $1.40 per website. The manual backup can already be tested – it’s the backup you already have in your mirrored Orion account, only without the automatic part. You can access your mirrored Orion account by clicking the tab icon at the top right of your ManageWP dashboard. So much fuss over this pricing and most of the customers will benefit from this. It’s in human nature to be afraid of any changes but after some time you ge used to it. Keep up the good work guys! Is it possible, right now, for me to add any free sites to my plan… or will I have to wait 8 weeks for that?? You’ll have to wait, but there’s a possibility that we’ll let you start adding free websites some time before the Classic goes away, so you could hit the ground running. Will you allow Pay Pal payment? We are working with PayPal to reach an agreement that will let our users pay with PayPal. It probably won’t be live straight away, but in the last quarter of 2016. I have 48 sites on the Pro plan right now. A few are never updated, so I don’t really need backups. For another handful, weekly backups are sufficient. For 32 of them, I have a maintenance agreement that includes daily backups. I just calculated my costs, and I will actually save some money with the new pricing. I really appreciate all the work you folks have done, just to give me better features and charge me less. 🙂 Seriously, I don’t know what I would do without ManageWP. Thanks so much! Thanks for sharing your case, Donna. My team and I appreciate your support. At what point will we be able to start creating our own custom plans – is that once the Classic dashboard goes away? I can’t figure out the cost for my plan using your calculator — I have the Standard plan for 50 websites, and I’d like to bump that up to 65- 70. The only tool I want to use is Weekly backups, possibly uptime monitoring on a few. Is it worth it for me to upgrade to Professional (75) or should I wait? What would my cost be? Pricing for 75 sites with weekly backups would be $75 on the new pricing layout. Like Curtis said, Weekly Orion Backup is $1 per site, but you also get a discount for the number of websites, so it’s $63.75/month. On the other hand, if you lock in the legacy Professional (75) plan, you will have Daily Orion Backup for a total of $96/month. It runs much more frequently, but I don’t know if the extra $30 is a problem. So I still can run Manual Backups whenever I want, on the standard plan? Am I understanding that correctly? Thank you for your support, Curtis! I have a Standard plan for 35 websites (of which I’m currently using 32), for which I paid around $160 last year. My subscription is up on April 24. Your new pricing model makes no mention of Standard legacy plans, only Professional and Business. I do not use your backup, or uptime monitoring ; I just use the dashboard to be able to access all my sites conveniently from one place. Does this mean I there is a free version I would use, going forward? The Standard plan is mentioned in the article, you’re getting Manual Orion Backup, plus all the free stuff. If you like the manual backups, you’ll just keep on trucking. Your subscription will automatically renew each year for as long as you’re happy with the service. 2) Switch to Orion pricing when it goes live, and put all 30 websites on a Weekly Backup plan, for a total of $31.50/month. Personally, the 2nd option is way better. With Orion pricing, you don’t have to lock in anything. If you have 17 websites, you pay $17, minus the bulk discount. 18 websites, $18/month. Yes, thanks for clearing it up. Sounds great to me. This is definitely a case of “don’t make me think” I don’t want to have to figure out price per site; I have too many sites for that. When I buy tools, I always buy the full or “dev” version just so I don’t have to think about how many licenses or how many tools or how much space. I just want the full package, always there when I need it, for however many sites I need it. I don’t think I’m your target demographic any longer. Thank you for your feedback, and I’m sorry to see you’re considering leaving after being with us for so long. 1) I want to know the cost for each new client, so I need a clear idea how much profit that client would bring in. 2) On the other hand, I really hate dealing with product tiers and licence limits. A lot of times I end up overpaying because it’s a hassle to switch tiers. I want as little micromanagement as possible. What I really like about the Orion model is that I’ll add my billing info once and forget about it. I know that the monthly expense for my “Awesometastic” plan is $4/website, so no matter if I have 7 or 207 clients, the cost will never be more than $4 per client. Don’t laugh, “Awesometastic” is a real word! I have a Standard Plan with 5 websites. With this “new plan prices” can I have this 5 websites with the manual Orion backup + all free tools, and add more (2, 3, …) websites only with the free tools without additional cost? I have 75 websites on the professional plan, and I’m currently paying 96.00/mo. The same number of websites, with daily backup, and uptime monitor, nothing else, is now 191.25? Is that right? almost 100.00 more a month? Per website price has gone from $1.28 to $3.00? The Uptime Monitor is currently a part of the Business plan. The Professional is just the Daily Backup, which is $127 for 75 websites, or $1.70 per website. The main difference is that the Orion backups are an improvement in pretty much every way. They are much more reliable, use less resources, incremental, and come bundled with free off-site storage and a hardened Clone tool. It is everything a WordPress backup & migration tool should be. You can, of course, remain with the legacy Professional plan, and get the new backup for the same price you’re paying now. I had serious problems with Classic backup with a couple sites and could never figure out why. Orion backups are FAR more reliable. I’m switching my 10 sites from Professional (legacy) to Orion with uptime monitoring and daily auto backups. The cost doesn’t change (still $30 per month, although for 10 sites instead of “up to 15”) but I like the flexibility Orion will give me. I COMPLETELY sympathize with the customer who just wants to “set it and forget it”. That’s certainly a valid opinion. Mine is the opposite. I do not mind sacrificing a little bit of convenience for the much-more-flexible Orion pricing (and I prefer to only have to pay for the number of sites I actually have set up with you).